The system is made up of a 2’ x 6’ grid, baskets, hooks, shelves etc. 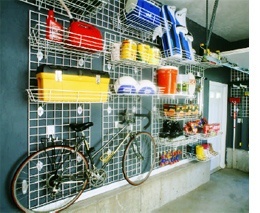 The Garage Grid is easily adaptable to the changing needs of today’s active, mobile families. It is very easy to install and, being portable, you can take it with you when you move. Getting your garage organized has never been easier or more affordable. We can even install them for you!